What are the misspellings for yesterday? 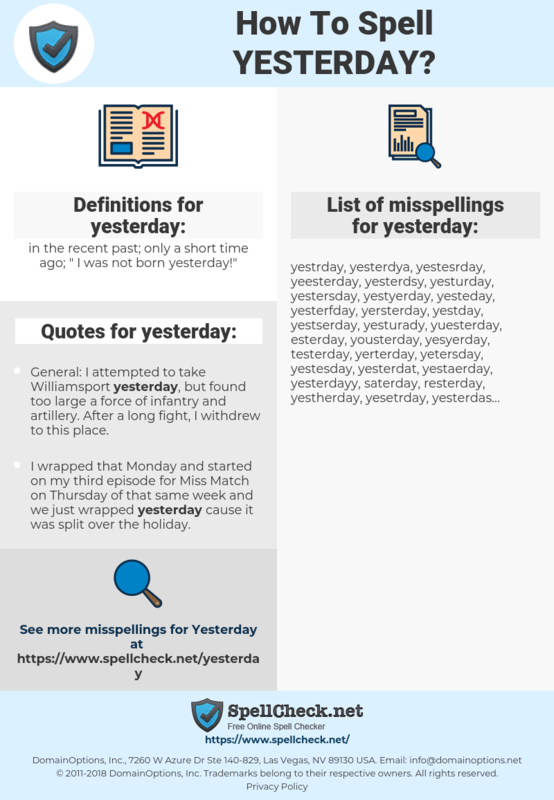 What are the common mistypes for yesterday? What is the definition of yesterday? What are the usage examples for yesterday? What are the quotes for yesterday? What are the translations for yesterday? 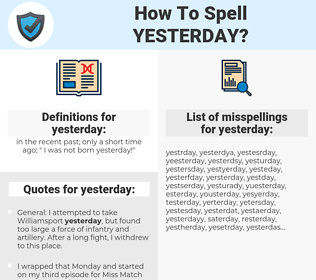 What are the common typos for yesterday? This graph shows how "yesterday" have occurred between 1800 and 2008 in a corpus of English books. General: I attempted to take Williamsport yesterday, but found too large a force of infantry and artillery. After a long fight, I withdrew to this place. Yesterday I staked off the ground on the hill for an orchard. I want to get 1000 apple trees agrowing. I was bargaining for time away from Hollywood, and Columbia was bargaining for money. I got what I wanted and they got what they wanted. They knew I was so anxious to do Born Yesterday that I'd have done it for a dollar. They gave me the next best thing. hier, Gestern, am gestrigen Tage.